A bloodstained tunic belonging to St Thomas Becket is to be returned to Britain from the Vatican to help mark the 850th anniversary of his murder. Source: The Guardian. It will also mark the 800th anniversary of the creation of the former archbishop of Canterbury’s shrine. 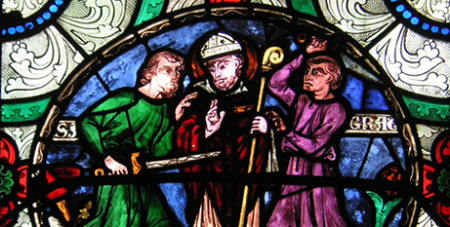 Canterbury Cathedral, where St Thomas Becket was killed in December 1170 following a bitter dispute with King Henry II, became a shrine after Pope Alexander III made Becket a saint following the murder. It drew thousands of pilgrims from England and across Europe until the shrine was destroyed in 1538 by Henry VIII. Canterbury Cathedral will host a series of celebrations in 2020 to mark the anniversaries, including a joint Catholics and Anglican service and an exhibition of artefacts linked to St Thomas. Given the destruction during the Reformation, when Henry VIII broke with Rome and ordered the dissolution of the monasteries, Canterbury itself has little left of the saint’s body or his belongings. But the tunic – or more properly tunicle, a garment worn to celebrate Mass – escaped destruction because it was given to the Pope by Henry’s father, Henry VII, 50 years earlier and kept in Rome. It has since been housed in the Basilica of Santa Maria Maggiore in Rome. Negotiations have been going on for some time between the Vatican and the Church of England over how to commemorate the anniversaries. It was Columban Fr Robert McCulloch who suggested the tunic might be loaned to Canterbury for the commemoration.